Hilary Maxwell is the current Member Services Coordinator at The Dance Centre. She coordinates between members who are current artists and The Dance Centre delivering them workshops, programs and performance opportunities to support their practice. Hilary has a BA in dance and a MFA in drama, specializing in performance and choreography from U of C (University of Calgary). She has performed, taught and choreographed in both Vancouver and Calgary while working administration jobs. Her repertoire includes Jason Stroh, a Calgary based artist who was my teacher throughout high school for three years; I wanted to find out what her experience was like working with him professionally. As her current Administrative Assistant intern, I chose to speak with her to find out how she balances between training and performing and working an office job. I spoke with Hilary during my working hours as an intern in The Dance Centre offices Tuesday, February 10th. Anna Dueck: Are you originally from Vancouver? Did your dancing begin within the city, if so, in what context? Hilary Maxwell: Yes, I’m originally from Vancouver. Well, I’m from Vancouver but I went to high school on Vancouver Island to Brentwood College secondary and I took the dance program there, it’s a very small program. I did ballet, jazz, tap; I went to Vanleena Dance Academy, I did that from grade four to eight, and then when I went to boarding school, dance was just three days a week for an hour. In boarding school it was the first time I did contemporary dance, it was my introduction to that. One of my teachers there who inspired me to continue dancing was Treena Stubel, she was a dance artist based in Vancouver. After I graduated high school I was looking into universities that offered dance degree programs and U of C was the one that I selected. AD: Did you look into any other universities when you began to research post-secondary institutes? HM: I didn’t. When I was looking into universities, dance was something that I excelled at. I started researching universities with dance degree programs but also I also looked at TDT [Toronto Dance Theatre] but that was before they had a degree program. I went to Toronto; I looked at York University. I went to Montreal and looked at Concordia, but it was more creation based and I wasn’t interested in that at the time. It was when I was at York I was talking to a professor at the university just finding out more about their program and I was telling them about my interest[s] and they suggested Calgary, I hadn’t even thought about it, I didn’t know that U of C had a dance program. It was aligned with what I was interested in, focus[ing] a lot on training, performance and getting a general academic degree alongside that. AD: What made you pursue a Master’s degree after your undergrad? And why did you choose to stay at the same university rather than changing institutes for further educational development? HM: I hadn’t thought about doing a masters right when I decided to apply for it. I had been living in France for a year and when that year came to a close I thought about moving to Montreal to continue my French and to get a job and to dance. I was there for 3 days [in Montreal] and I had an email from one of the professors at U of C, Melissa Monteros, who told me about a special case masters program that they were starting and invited me to audition. Calgary was the last place I had a community and the masters program was through the department of drama and was focused on performance and choreography. The first year the participants of the masters program were going to be dancing in a sort of company ensemble structure. We started working with different choreographers throughout the first year, that really appealed to me and then the second part was more practical and we put on a concert at the end of our second year. The choreographers that we were working with were from across Canada and local choreographers and it just interested me. AD: You completed your undergrad in 4 years, then moved to France and returned to Canada to complete your masters? HM: 5 years. I graduated in 2002 and I moved to the South of France first and I studied French for 5 months and then traveled, then I returned home to Vancouver and I just worked and took classes. Because I have an interest in French, I wanted to return to France cause I felt I was just getting the grasp of learning the language, so I moved back to France. I guess that was in 2004/5 and stayed in Paris for a year and then I started the Masters program September 2005. I stayed in Calgary until August 2011. When I finished the program I just worked as an independent dance artist teaching and performing, some choreographing and worked at a dance presenting company called DSW (Dancers Studio West) for four years, doing administrative work. AD: What would you describe as DSW’s main objective and goal as an organization? HM: While I was there, there was two different Artistic Directors at the time so some of the programming changed, but it focused on artistic development. When I was there, his name was Brian Hansen, the season was half presentation of touring Canadian artists and half artistic development program. We had a festival called Alberta Dance, well at the time it was called Dance Explosions and we had an artist in residence. When Davida Monk came in she took over the Artistic Director, she really stream lined the program and the mandate and it predominantly focused on artistic development, because she wants to provide opportunities for choreographic research, training for dancers. There [are] artists, artist in residencies, dance labs and still the festival that has been on for many years. A couple years after I left maybe, DSW, left its physical home. It still exists, but its just not attached to a theatre anymore. DSW [was] where a lot of opportunities for young artists took place; presenting opportunities and research opportunities, a lot of my dancing and performing happened there after university. AD: Did you see yourself doing an administration job after university? HM: No I didn’t, I just, as I had said earlier, just when I graduated had thought okay I’m not doing anything unrelated to dance. I was really fortunate and maybe its because I came out of this university context that I had made a lot of connections. I had been wanting to be working as a dance artist and when the job at DSW, part-time administrative job had come about, it supported my work as a dance artist. I think its hard – unless you’re in a full-time dance company – to just be working as a dancer and surviving off of that. I wanted to have a diverse in work experience to support like my first and forth most interest, which is being a dancer and performing and producing work for a choreographer. AD: After you completed your Masters, you returned to Vancouver? HM: When I was in my fourth season with DSW, and I knew I was moving back to Vancouver I contacted TDC (The Dance Centre). I was moving back in August 2011, but I contacted TDC back in February 2011 once I knew it was my last season there. 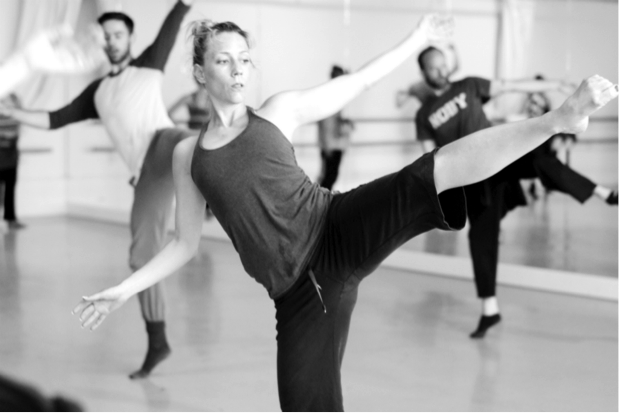 I wanted to work here because it’s a hub for dance in Canada and I thought it would be a great way to connect and meet local artists and really quickly get immersed in the dance community. TDC on a much larger scale, has a presentation season, also operates a building, I thought this could be something similar. I could do administrative work there and get involved in the community through that avenue. I reached out to Mirna Zagar, the director and we just kind of stayed in communication throughout the year. It’s a small staff so there wasn’t an opening right away but she was really generous with her time with me and trying to find something for me. It actually just aligned really well, because a couple weeks before I moved, the person in my position had given their notice, then I had stepped in, in a part-time capacity, that was August 2011. AD: How long do you see yourself staying with TDC? What are some of your future goals? HM: I don’t know what the future holds. It’s a great place to work and I really want to stay involved supporting this art form in whatever way. I do to have a diverse work dance life kind of structure, my rule has kind of evolved since I’ve been here, and my commitment has kind of changed. If there’s room for growth and development, it’s a great place to be and it’s a great staff and just to be in an environment that is supporting dancers and the art form, is, is rewarding. AD: What difficulties do you face when trying to keep up with your training and performance when you work an office job? HM: It was definitely difficult the first two years my work structure is different than what I had before. It’s the first job that’s nine to five and when I moved here I wanted to show my commitment and everything, and it was just a different kind of structure … not flexible hours. That was definitely difficult the first two years. I was able to adjust my schedule so that if I came in early I could go run down on my lunch break take dance class and come back and sit back at my desk and do my office job; that’s something I had worked out with Mirna, when I can, I do it. AD: Can you please tell me about the piece “Thessonlike” you choreographed while in Calgary. HM: My focus has been more definitely on in performance. Even though my degree was performance and choreography my interest was more in being an interpreter, and working for other choreographers. But I had done some and the piece that I did for the Fluid Arts Festival was actually originally a part of the Inaugural Prairie Dance Circuit, before there were two cities as part of the Prairie Dance Circuit, Calgary and Regina. I choreographed for that and it was part of the 2010 Fluid Arts Festival because one of the choreographers in that four-city Prairie Dance Circuit tour was sick. I just stepped in because the piece had already been performed earlier in the year, I had the work shown in the Calgary addition of the tour. AD: How did this piece end up being featured on a dance tour? HM: It had a little mini tour between Regina and Calgary but it was part of the Inaugural part of the pilot project for the Prairie Dance Circuit. The Prairie Calgary performance of the Prairie Dance Circuit fell in line with the Calgary the Fluid Arts Festival, it was still a part of the Prairie Dance Circuit within that festival. The piece Thessonlike, it was based on or inspired from this, mythological story. About this woman, a woman I think she’s heart broken or something, its Greek mythology, she throws herself into the ocean and commits suicide. She turns into this creature and I guess what I thought was interesting about it was this idea of transformation. A woman that I worked with, Jenn Jasper, it was interesting because for her at that time she herself was going through some kind of personal transformation, it worked out well. It wasn’t just literally about that but there was imagery that came out about it, from this myth and the idea of transformation. AD: You also performed in the Fluid Arts Festival in a solo choreographed by Jason Stroh. How did you begin working with Jason and this specific project? HM: That solo was part of the first year of the full Prairie Dance Circuit, it’s a four-city tour. Then it went on after the tour it was performed in Vancouver in 2011 at Dancing in the Edge. I had worked with Jason quite a few times, before we started on the solo I had just finished working with him in a DSW dance lab, he was the choreographer. I had a small solo in the piece, in the Dance Lab and there was some material in that that he was interested in developing. He was an invited choreographer in the dance circuit, he then invited me to dance for him. The piece obviously changed from what was in the lab, but we had just a really good working relationship. AD: You most recently worked with Serge Bennathan in EDAM Dance’s “Threshold”. What was it like working with Serge? How did you get involved with this project? HM: Working with Serge, it was pretty exciting on many levels because first of all since I’ve moved here in 2011 its the first time that I’ve performed, in a context that’s not a studio showing, it’s a produced performance. He invited me to be in it, just because he thought it would be fun to be creative together. It was a duet between me and Karissa Barry, no it wasn’t a duet, scratch that it was a trio. Karissa Barry and I were dancing throughout the piece and then Serge was reading poetry. It was a collage of text and dance. I think, what I kind of took it as were how the two coexist within the space. There’s moments where they seem really connected and times when they’re not. But yeah working with him … [you] feel … it’s more than just learning the movement, he has a very distinct kind of aesthetic I suppose. He uses a lot of dynamics and imagery to encourage the dancer to get deeply into his work and he would often in order to, for me I guess, to get into the work, it would be through this deep physical place, to connect with my imagination or imagery a lot. He once said there was this part where we were getting pulled back stage and he’s like “imagine if someone grabbed, this giant ogre grabbed the flesh of your back and pulled you back, how would that make you feel?” I found it sometimes to be a therapy session (chuckles). He’s so good at pin pointing and he blocks something that maybe its an emotional block or that there’s something else that’s in the way of accessing the physical. It’s similar working with Jason because I feel it’s definitely an experience that’s happened. I’ve gone through a transformation, totally. It feels like the movement I’m performing on stage is actually just the way, its just the way that character or whoever I am, however I’m interpreting would normally move. It doesn’t even feel like choreography or dancing it’s just my way of communicating. AD: In Serge’s piece you worked along side Karissa Barry, were you familiar with her before you began working? What was she like in the process? HM: I didn’t. I’ve seen Karissa perform and I’ve always thought she [is] a powerhouse and a sensitive and thoughtful performer. I was a little nervous because I thought; oh this woman is incredible. I liked working with her, she’s very generous and open and supportive I felt immediately comfortable working alongside her cause Serge is so good at drawing out from each person what he is interested in. The ground and the room it’s very neutral. You’re there just to work, it’s all about the work, she has a really good work ethic, I feel like I do; it was a very fruitful productive environment. AD: What do you see yourself doing in the future? HM: I don’t know, I mean I could just say I don’t know exactly but I hope to be doing more dance work where I’m in a process, creation based work. I just hope to be dancing more, find an even better balance between the physical part of my job and the administrative part. I guess I would [be] interested in my work in kind of the administrative work to develop to working more with artists. I like to be involved with people, and its really satisfying when what you’re doing maybe just in the administrative way is supporting the goals of another artist. In whatever that might be.